HONG KONG, Tuesday, 6nd March 2018 – CSG Hong Kong has found that, despite being seen as a strong brand ambassador, David Beckham is unlikely to garner interest for AIA’s insurance products. 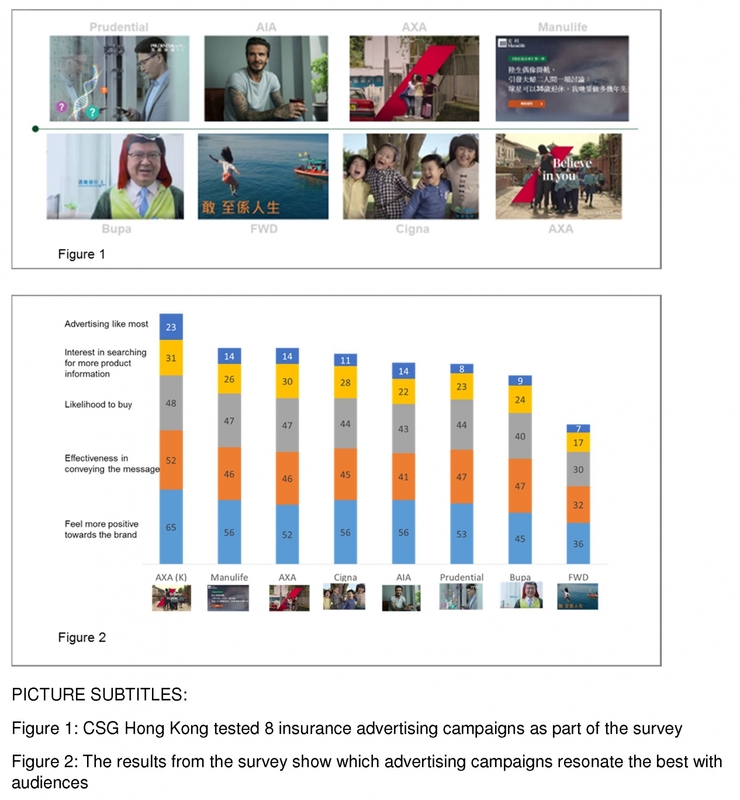 The findings come as part of a new market research study comparing the effectiveness of eight advertising campaigns from seven insurance brands in Hong Kong. Members of the public aged between 18 and 55 were asked to rate the different campaigns on factors such as the ad’s effectiveness in conveying the message and whether it made them interested in learning more about the product. The football star was chosen by AIA to become global ambassador for the brand and to front its ‘What’s Your Why?’ campaign, aimed at raising awareness of healthy living in Asia. However, despite being a popular figure among the younger participants (particularly women), many failed to see the connection between Beckham and the insurance brand, with some also commenting that “he is involved with too many products and brand endorsements”. Although it achieved disappointing results in the survey, the AIA David Beckham campaign wasn’t the lowest-rated of the eight; the weakest of all was the FWD “Live For Now” campaign, which had the lowest scores across all of the categories. The ad was designed to inspire viewers to live life to the fullest, but the Hong Kong audience perceived it as lacking relevance to everyday life. In contrast, the AXA KATHMANDU ad campaign hit all the right notes with its Hong Kong audience, rating the highest on all five key measures in the study. This campaign – AXA’s first-ever global brand campaign – is based on the journey of Lisa, an AXA client, who was injured during the tragic events of the 2015 Nepal Earthquake, and her path to recovery. According to Donna Cheung, Director of CSG Research, who conducted this study in November 2017, the KATHMANDU ad campaign has been a great success overall; “This campaign has a very positive impact on AXA’s brand-image; it not only informed customers of AXA core message, it generated interest in AXA products”, she said. Based on the success of the AXA KATHMANDU campaign, Donna suggests that brands attempting to create engaging ads “continue to focus on the customers and connect with them with an authentic message/voice. It is the only sustainable successful strategy for long-term growth”. As the recent research by CSG Hong Kong demonstrates, there are many elements and factors that contribute to the success of each campaign. Although celebrity can generate strong brand recognition, it can often be a double-edged sword, as in the case of the AIA David Beckham campaign. CSG is one of the leading marketing research firms established in Hong Kong in 1982 offering comprehensive research services to clients in diverse industries and a marketing research pioneer in Greater China. The company has further expanded from providing regional to global marketing research services through its connection with the Win/Gallup International network. CSG offers a full range of research methodologies and solutions, including innovative tools like facial coding and eye tracking. In 2013, CSG became a member of the INTAGE Group which is the leading market research organisation in Japan and is ranked 7th largest globally. For more information, please visit https://www.csg-worldwide.com/. Toluna is a leading provider of real-time digital consumer insights and empowers companies to brainstorm ideas, uncover new business opportunities and answer their questions in real time. Toluna is transforming the way marketing decisions are made by bringing consumers and brands together via the world’s largest social voting community of nine million members across 49 countries. This real-time access to consumers is coupled with its state-of-the-art, market research survey and analytics platform. Toluna has 18 offices in Europe, North America and Asia Pacific. Toluna QuickSurveys platform is a DIY Survey and Analytics platform which supplies enriched panel sources operated by Toluna. For more information, please visit http://www.toluna-group.com/.